Office: 4401 S Kansas Ave. Contractors continue to be one of the most complained about industries in the United States. Unfortunately, it is all too common for customers to be trapped into a bad situation, which can result in huge loss of money, tremendous stress, and unbearable amounts of frustration. Don’t get stuck in this situation, go into the process well-educated and ready to hire a contractor like a pro! 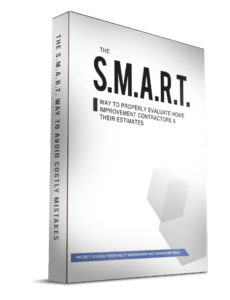 To make this easy for you, we’ve developed a five-step process called SMART to avoid the most common tricks used by contractors today. The start to a bad relationship with your contractor is a vague contract or estimate. Your contractor needs to be specific, describing every detail of the potential work. The Better Business Bureau and the Federal Trade Commission have written advisories for getting a written contract or estimate. Both write that it must be a thorough description of the work to be done, with full details about start and completion dates, total cost, a payment schedule, and the contractor’s information. Never sign a contract without reading it carefully. If any information seems to be missing, don’t let it slide. Continue asking for specifics until you are satisfied. And make sure you a retain a copy of the contract once its signed, and file it for your records. By having everything in writing, it prevents the contractor from going back on his word. It holds the contractor accountable for the specifics of what they said they were going to do. Nobody likes buying something that doesn’t work the way you want it to. This can be frustrating for even the smallest purchases, much less a huge construction project. The key to avoid this dissatisfaction is to be properly educated on your options so you can be confident you are making the right decision. This can be difficult, however, when a contractor only provides you with 1-2 product options. If salespeople only show you a couple of options, this is a big red flag, and shows an obvious bias. Your contractor should be doing everything in their power to provide you the best product for your project, not just the one where they get a commission. Only a company that offers multiple options from many manufacturers can truly provide you with the highest quality and most cost-effective solution for your home. When contractors don’t fully inspect your home, they can easily misquote you with the intent of “discovering” more work, which means more money, after the job has started. A successful home improvement project starts with a thorough inspection. An inspection should include a close look at all the factors that led to the current home condition, and all the components. For example, for a roofing project, your contractor should closely inspect the roof, which typically includes walking on it. They should also conduct a thorough attic examination to see the condition of the wood decking. For window or siding projects, careful examination of the wall assembly, flashings, penetrations, and overall building is absolutely critical. Other projects have specific aspects that should be examined as well. Your contractor should also be taking photos for reference, and ask questions about whether you have pets or children so they know where to be careful. Never hire a contractor before this through inspection is done, and be sure to demand a review of an inspection report to evaluate the recommendations in the estimate. Protect yourself from getting swindled by making sure the contractor’s company is legitimate and reputable. It is unfortunately common for some contractors to make promises they don’t keep, take advance payments and never complete the job, or don’t finish the job within a reasonable time period. Never trust a contractor by his appearance alone – demand to see a all necessary certifications. Contractors should show you their Certificate of Insurance, Division Safety & Buildings registration card, lien Waivers, Better Business Bureau Listing, among others. Look them up online on Yelp, Google, Angie’s List, and more, to see what other customer have to say. All reputable contractors should have lists of references, so call a few of them to double check. Conduct your proper due-diligence to ensure the contractor is fully qualified and avoid some nightmares down the road. 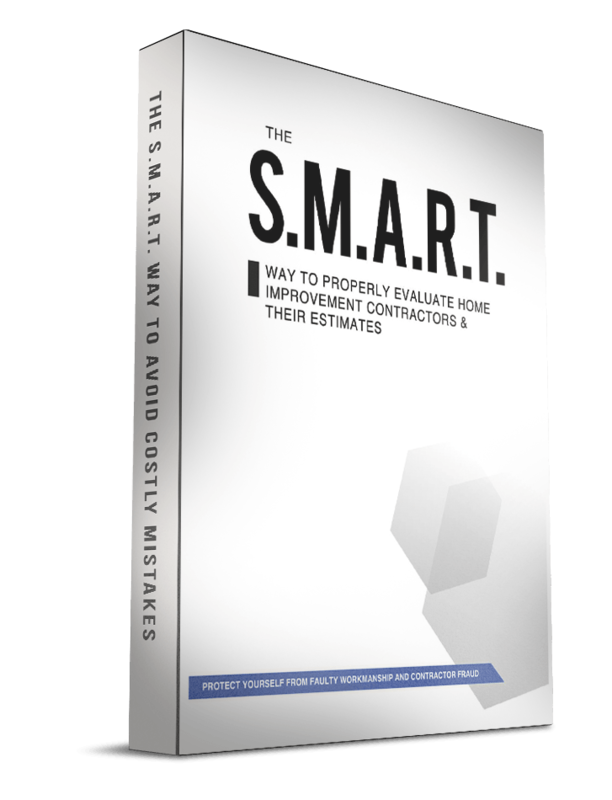 If you have already begun getting estimates from home improvement companies, take every estimate and evaluate it next to the SMART guidelines. You can download the full document here. If you’ve haven’t started the process, use the information in the SMART document as a guide on how to properly screen contractors prior to inviting them to your home. Take the time to do your research beforehand, and you’ll be very grateful when you have a great contractor who provides an excellent finished product! If you have any questions at all, please contact us and we’ll do our best to answer those questions for you.